"A no nonsense approach, loved it"
Azhar Ahmed, passed second time, December 2006 at Mill Hill. Urban Driving School will only accept links which are relevant to the car or driving industry to maximise the full potential of the link exchange program. Therefore do not ask us to link to you unless you feel your website is relevant. 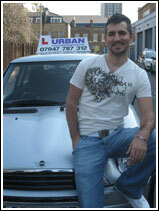 <a href="http://www.urbandrivingschool.com" title="Urban Driving School - the ultimate in driver training ">Urban Driving School</a> - The ultimate in driver training, one of the fastest growing driving schools in London offering Theory and Hazard Perception Tests. www.theory-test.co.uk - Practice online Driving Theory Test Questions, Driving Theory Test Preparation Sessions, Hazard Perception Test Sessions, Car theory test Practice and mock Theory test Practice, online driving theory test question available at www.theory-test.co.uk. Outdoor Patio Covers - Cover Bonanza is dedicated in providing wide range of covers for patio furniture, automobiles, accessories and industrial equipment like patio table covers, lawn furniture covers, canvas boat covers, pontoon boat covers, rv trailer covers,golf cart covers and truck camper covers. Compare Driving Instructors - Compare Driving Instructors in all UK towns and cities with a few clicks.